One day, four people in their 30s happen to meet &#8211; Maki Maki (Matsu Takako), a first violinist; Sebuki Suzume (Mitsushima Hikari), a cellist; Iemori Yutaka (Takahashi Issei), a violist; and Beppu Tsukasa (Matsuda Ryuhei), a second violinist. They have not fulfilled their dreams nor reached the peak of their lives but have stopped before a gentle slope. 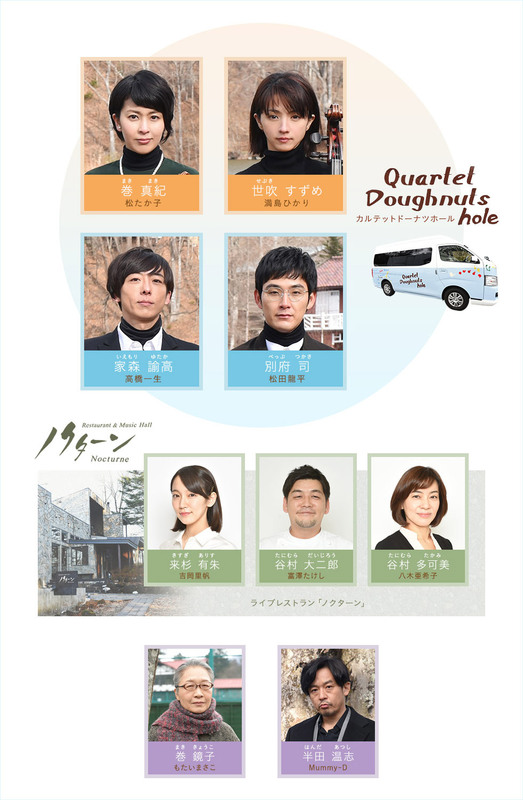 The four of them form a quartet and end up spending one winter in beautiful Karuizawa. However, this �gcoincidence�h hides a big secret. ...will watch it again for the lovely chamber music.Slow tempo, but it's winter anyway. Every player has their own story or history to tell. The dialogues are funny, but they can also be very sad. The storyline reminds me very much of Overtime. Some idealists and realists in the story. But they all have dreams. Matsu-san hasn't aged much. The wide age gap of the cast wasn't apparent. On the whole, it's great cast, just like Overtime, warm and cosy. I loved this for the fast-paced dialogues and cast but must admit that the story lost its way during episodes 6&7 and I love Kudo Kankuro (guest starring) but the quartet and their challenges are a bit forgotten. Too much airtime was also given to the waitress who's eyes don't smile. Still not sure why she was in this.They nicely showcased the breakdown of a marriage though so all is good. 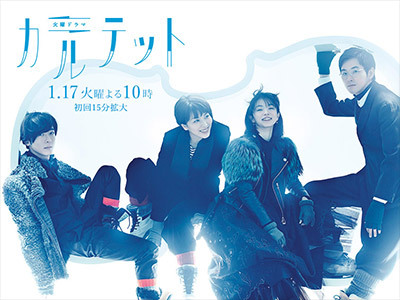 It wasn't bad, but when you have talent like Matsu, Matsuda, Mitsushima, and the writer is Yuji Sakamoto who has written dramas like "Mother" and "Soredemo, ikite", I was expecting more. Overall, somewhat disappointing.